Good Morning! 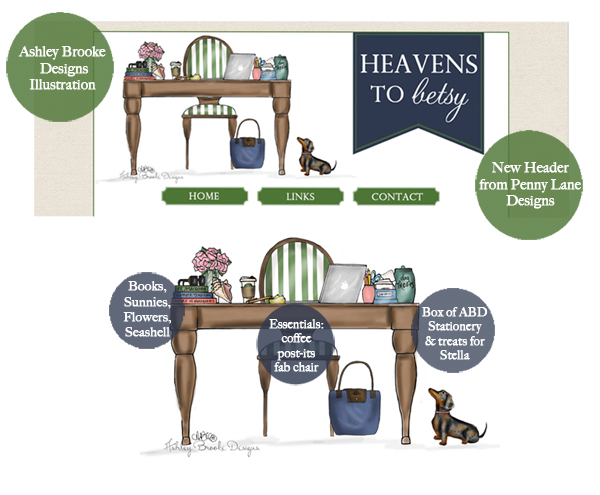 I'm SO excited for you to see the new look here at Heavens to Betsy! I've been wanting to revamp things around here for awhile and I think the latest version of HTB suits me to a tee. I am so thankful for my desk illustration from Ashley Brooke (she's also responsible for other fun elements you'll see around here later on) and the header text and overall layout from Penny Lane Designs--thanks girls, you are the best! Be sure to click over and check it out! Love the color scheme! These are my wedding colors! Beautiful job! Love it!! Both ladies did a great job!! I love you new banner! How wonderful that it is so personalized!